DevTools can sharpen your dev process, help you discover the tools that can optimize your workflow and make life easier. Google’s nightly updated version of Chrome, the Chrome Canary, includes the latest and most powerful dev tools as an early release. 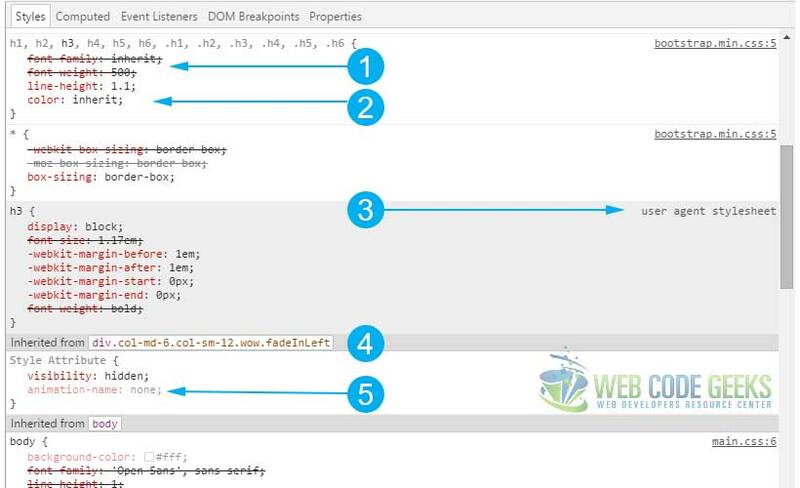 From finding DOM elements to device mode view let’s explore the panels. Use the Elements panel to iterate on the layout and design of your site by freely manipulating the DOM and CSS. Examine and edit the current element’s box model parameters using the Computed pane. All values in the box model are editable, just click on them. The concentric rectangles contain the top, bottom, left, right values for the current element’s padding, border, and margin properties. If you haven’t set up persistent authoring, any time you reload the page, all live-edits are lost. The Styles pane shows the CSS rules that apply to the selected element, from highest priority to lowest. In more detail, here is the meaning to different sections or signs in your style pane. Inherited styles are displayed as a group under the “Inherited from ” header. Click the DOM node in the header to navigate to its position in the DOM tree view. Use the Elements panel to inspect all elements in your page in one DOM tree. Select any element and inspect the styles applied to it. To expand a node, double-click anywhere on it or click on the arrow next to it. The Chrome DevTools Console panel is your focal point for direct interaction with a page in real time. The console is a full-fledged terminal you can use to interact with your page during development. 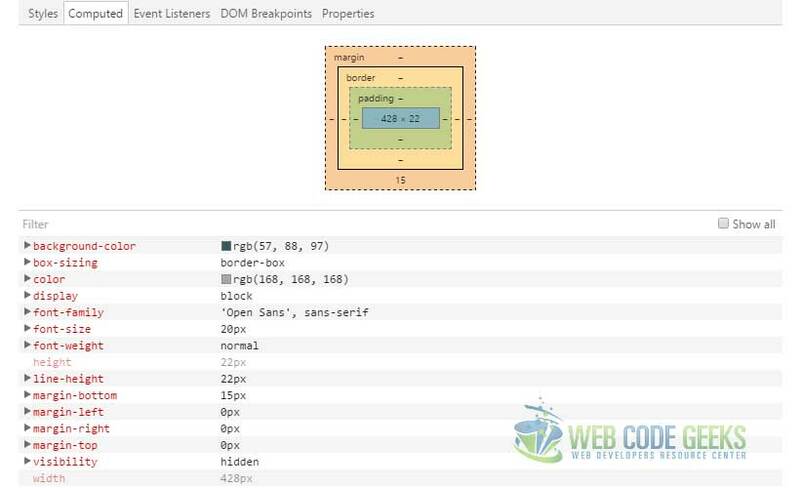 Using the console’s commands, you can select DOM elements, profile the CPU, monitor events, and more. Set up persistent authoring in Chrome DevTools so you can both see your changes immediatedly and save those changes to disk. Chrome DevTools lets you change elements and styles on a web page and see your changes immediately. By default, refresh the browser and the changes go away unless you’ve manually copied and pasted them to an external editor. Workspaces lets you persist those changes to disk without having to leave Chrome DevTools. Map resources served from a local web server to files on a disk and view changes made to those files as if they were being served. Select Add Folder to Workspace. In addition to editing existing files, you can also add and delete files in the local mapped directory you’re using for Workspaces. Right-click a folder in the left Sources pane. Type a name for the new file including its extension (e.g., newscripts.js) and press Enter; the file is added to the local folder. Right-click on the file in the left Sources pane. Choose Delete and click Yes to confirm. Before making substantial changes to a file, it’s useful to duplicate the original for back-up purposes. Type a name for the file including its extension (e.g., mystyles-org.css) and press Enter. When you create or delete files directly in Workspaces, the Sources directory automatically refreshes to show the file changes. To force a refresh at any time, right-click a folder and choose Refresh. This is also useful if you change files that are concurrently open in an external editor and want the changes to show up in DevTools. Usually DevTools catches such changes automatically, but if you want to be certain, just refresh the folder as described above. To search for a loaded file in DevTools, press Ctrl + O or Cmd + O (Mac) to open a search dialog. You can still do this in Workspaces, but the search is expanded to both the remote loaded files and the local files in your Workspace folder. Open the search window: click the Show Drawer button Show drawer and then click the Search; or press Ctrl + Shift + F or Cmd + Opt + F (Mac). Type a string into the search field and press Enter. If the string is a regular expression or needs to be case-insensitive, click the appropriate box. The Network panel records information about each network operation in your application, including detailed timing data, HTTP request and response headers, cookies, WebSocket data, and more. Name and Path – The name and URL path of the resource, respectively. Method – The HTTP method used for the request. For example: GET or POST. Status – and Text The HTTP status code and text message. Domain – The domain of the resource request. Type – The MIME type of the requested resource. Parser – Chrome’s HTML parser initiated the request. Redirect – A HTTP redirect initiated the request. Script – A script initiated the request. Other – Some other process or action initiated the request, such as the user navigating to a page via a link, or by entering a URL in the address bar. Cookies The number of cookies transferred in the request. These correspond to the cookies shown in the Cookies tab when viewing details for a given resource. Set-Cookies The number of cookies set in the HTTP request. Size and Content – Size is the combined size of the response headers (usually a few hundred bytes) plus the response body, as delivered by the server. Content is the size of the resource’s decoded content. If the resource was loaded from the browser’s cache rather than over the network, this field will contain the text (from cache). Time and Latency – Time is total duration, from the start of the request to the receipt of the final byte in the response. Latency is the time to load the first byte in the response. Timeline – The Timeline column displays a visual waterfall of all network requests. Clicking the header of this column reveals a menu of additional sorting fields. This is the case of a network emulator tool inside the dev tools. Network conditioning allows you to test your site on a variety of network connections, including Edge, 3G, and even offline. It throttles the maximum download and upload throughput (rate of data transfer). Latency manipulation enforces a minimum delay in connection round-trip time (RTT). Don’t assume performance is as simple as following a simple set of dos and don’ts. Rules can change, and it’s easy to use rules incorrectly. Focus on the user first. How users perceive delays far outweighs any performance guidelines. RAIL is a user-centric performance model and stands for Response, Animation, Idle, and Load. 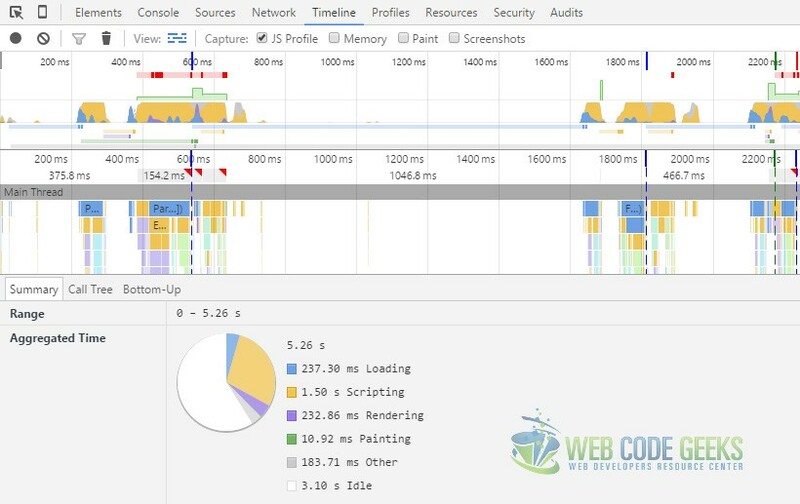 Learn how to test performance following the RAIL model and using your browser profiling tools. Use the Resources panel to inspect all resources that are loaded, including IndexedDB or Web SQL databases, local and session storage, cookies, Application Cache, images, fonts, and stylesheets. 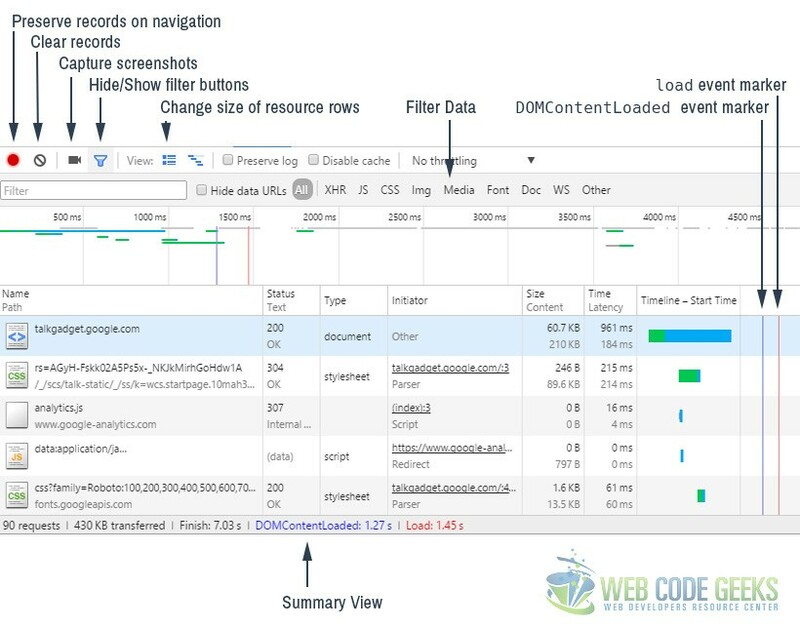 Inspect and manage your application’s local data resources using the Chrome Developer Tools Resources panel. Use the Device Mode to build fully responsive, mobile-first web experiences. Use Chrome DevTools’ Device Mode to build mobile-first, fully responsive web sites. Learn how to use it to simulate a wide range of devices and their capabilities. Emulate your site across different screen sizes and resolutions, including Retina displays. Responsively design by visualizing and inspecting CSS media queries. 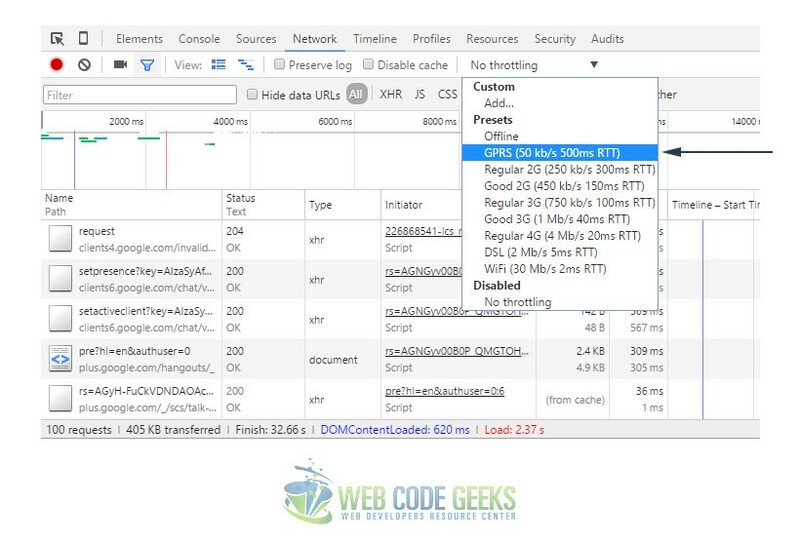 Evaluate your site’s performance using the network emulator, without affecting traffic to other tabs. How to enable Device Mode? Turn on device mode by pressing the Toggle device mode toggle device mode icon off icon. When device mode is enabled, the icon turns blue and the viewport transforms into a device emulator. You can also toggle device mode on and off using the keyboard shortcut: Ctrl+Shift+M (or Cmd+Shift+M on Mac). As your mobile audience grows, responsive mobile-friendly web design becomes all the more important. Web content needs to look and feel great across a wide variety of devices and network conditions. But testing the quality of your mobile experiences on a multitude of devices takes longer and makes debugging more complex. Chrome DevTools’ Device Mode lets you mimic how your development site will look in production on a range of devices. GPU and CPU behavior are not emulated. System displays, such as the address bar, are not emulated. Native displays, such as elements, are not emulated as a modal list. Some enhancements, such as number inputs opening a keypad, might vary from actual device behavior. WebGL operates in the emulator, but is not supported on iOS 7 devices. MathML is not supported in Chrome, but is supported on iOS 7 devices. The iOS 5 orientation zoom bug is not emulated. The line-height CSS property operates in the emulator, but is not supported in Opera Mini. CSS rule limits, such as those in Internet Explorer, are not emulated. The emulator does not override the UA for AppCache manifest files or view source requests. Despite these limitations, the Device Mode is robust enough for most tasks. There are endless ways you can test your web project in real-life-like conditions using the Chrome Dev Tools. They provide quite a wide range of tools for analyzing most aspects of your webpage. In addition there are also extra extensions that can be added to provide even further testing tools to make your dev experience more complete. Go ahead and try it yourself to see how much you can achieve.